I do quite a bit of reading. Up until recently, I was convinced that paper books were the way to go. And then I thought an iPad would solve all my “I want to read it electronically” problems. Then, slowly, I started to think about how some of the “just like real paper” e-readers might be handy. I ended up getting one of the simple non-glowing-screen-versions last year, and I had a chance to find out just how having a pocket-sized bookcase at my fingertips could change the reading game for me. One thing I quickly found, though, was that books could get lost in the shuffle. I needed to get things organized so I wouldn’t lose or forget what books I was supposed to be reading or wanted to read next. It seemed silly to keep written lists (in part because a certain child kept snagging my scrap of paper for drawing or a certain mom around the house (me!) kept throwing away the scraps of paper). My key to organizing titles on my Kindle was using collections as bookshelves. Since books can be in more than one collection at a time, I can cross-shelve in a way that’s not possible on my physical bookshelves. I “archive” (aka “remove from device”) most of the books I finish reading. I have not been a big re-reader so far in my life and probably more than half of the books I read I won’t reread. I trust I’ll be able to find them again through the power of search engine smarts. 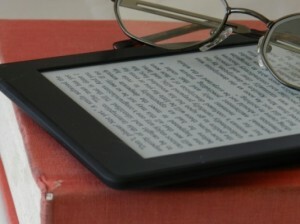 Amazon’s notes on organizing content on your Kindle. A handy website for converting files to mobi (and other) formats – I’m not such a fan of reading PDFs on my Kindle. Be warned, sometimes the converted files aren’t pretty. That said, I use this site all. the. time. Are Catholic Ebooks the Future of Publishing?